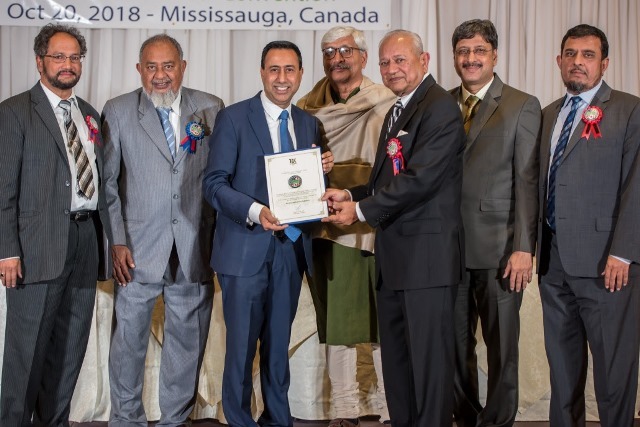 Toronto: The 28th convention of the American Federation of Muslims of Indian origin (AFMI) concluded in Toronto with a strong message to support pluralism ,defend democracy and democratic institutions against the divisive forces which are trying to divide people and spread hatred in the name of religion in India. Member of Provincial Parliament Natalia Kusendova (Mississauga Centre) presenting the greetings on behalf of Premier Doug Ford. Although mainly concerned about the education of Muslims in India the growing intolerance, hatred and division among the communities inspired the speakers to address the political conditions of the country. Speakers particularly Professor Apporvanand Jha of Delhi University, Adv Suhel Tirmizi, the president of Lokhit Prakashan Trust that publishes Gujarat Today daily newspaper, AFMI president, Dr. Khutbuddin, AFMI trustee Dr. A S Nakadar and incoming President Mr. Siraj Thakor discussed the political context in which education is being imparted. MPP Peter Tabuns presenting the community service award to Mr. Zeib Jeeva. Dr. A. Jha explained in details the rise of forces who in the name of religion have been trying to usurp India’s pluralistic values and impose its version of a faith that divides people and pitch them against each other to promote the politics of fear. He urged the people to join hands to defend causes of justice and strengthen those who believe in secular democracy. He defended the rights of religious minorities to practice their faith fearlessly without proving their patriotism to anyone. He also condemned the policy of uprooting people or lynching them in the name of faith. Advocate Suhel Tirmizi focused on deteriorating law and order situation in India where discrimination and biases are institutionalized against minorities and weaker sections of the society. He gave several incidents where state officials showed their personal religious biases to discriminate against minorities. Dr. Khutbuddin focused on the challenges the minorities have been facing in India and urged people to expose injustices and use all peaceful means to bring about changes. He invited Yong Muslims of Indian origin to take the leadership role in the organization. 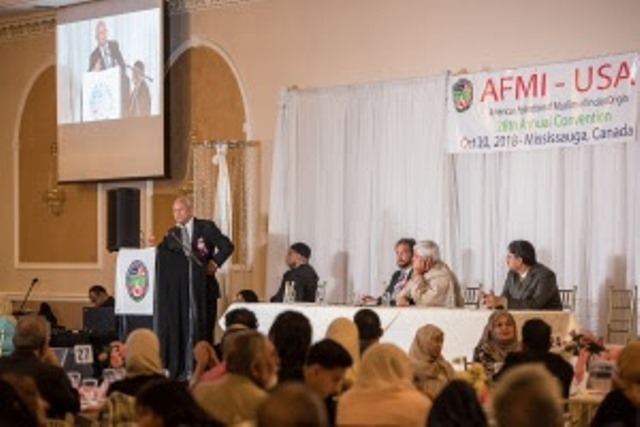 Highlighting the achievements of AFMI Dr. Nakadar said “When the organization began working in India, the literacy rate of Muslims was 30 percent, now it is over 70 percent among Muslims” . He gave many examples of Muslim youth’s achievements in education and added, “Education is the best Defense”. Sr. Neisha Eckhart chaired the convention and the vice chair was Zubair Khaja Mohiuddin. 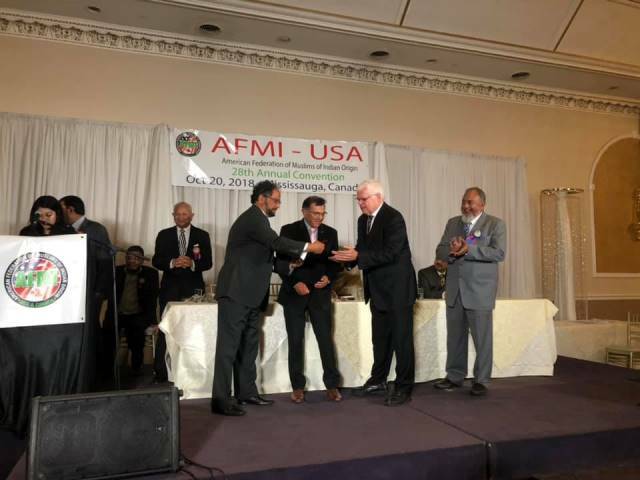 The Toronto team was led by Mr. Siraj Thakur, the incoming president of AFMI and Mr. Hanif Shaikh, president Toronto chapter, Mr. Muhammad Afroze, Shahnawaz Khan, Moiz Khan, and many others. The ‘Friends of Humanity’ was the main sponsor of the convention. 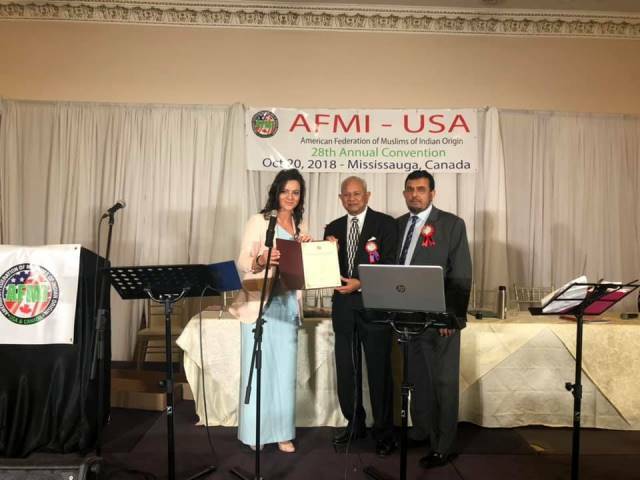 Natalia Kusendova, MPP, presented greetings from the Premier of Ontario Ford, recognizing AFMI’s work. He welcomed AFMI delegates to Mississauga-Toronto-Canada and wished the convention a great success. Over 550 people attended the AFMI convention. Prominent Canadian politicians like Natalia Kusendova (Member of Provincial Parliament -Mississauga Centre), Deepak Anand (Member of Provincial Parliament – Mississauga Malton), Peter Tabuns (Member of Provincial Parliament – Toronto-Danforth), Salma Zahid (Member of Parliament of Canada) were present on the occasion. While Asif Syed read the greetings from Sonia Sidhu (Member of Parliament- Brampton).